The recently discovered Rose Face Mask from Fresh is one of my favorites. It's a gel mask made from rose oil and water, chamomile, aloe, and cucumber, and it's so soothing. After going about my usual routine with Kiehl's, every two or three days I spread a thin layer of the mask onto damp skin and let it sit for 15 minutes. Once 15 minutes is up, I wash my face with warm water and it feels completely fresh - renewed, almost. But before I put on the mask, I wash my face with Kiehl's Ultra Facial Cleanser, take off any remaining eye makeup with Kiehl's Supremely Gentle Eye Makeup Remover and then tone it with, yet again, Kiehl's Ultra Facial Toner. I trust and stick with Kiehl's because it's consistently made my skin feel clearer and gentler. The toner removes any remaining crap off of my face, and it moisturizes it with Vitamin E, and kernel and avocado oils. To finish things off, I evenly spread Radiance Night Creme from Burt's Bee's over my face (avoiding the area surrounding my eyes) and dab a little bit of Origins' Eye Doctor cream under and over my eyes (so smooth). The Radiance Night Creme is 99% natural, made with royal jelly and shea butter, which really persuades me into thinking that this stuff is legit. I'm on my second jar so far and it has done my skin no wrong. I also love it because it's inexpensive and it works just like its more expensive counterparts that I've used before it. To avoid waking up with awfully dry lips the next morning, I put on Burt's Bees Lip Balm before jumping into my bed. Following suit are my hands, arms and legs with Burt's Bees' Milk & Honey Body Lotion. The body lotion is natural, made with milk, honey, coconut oils, and Vitamin E - it moistens my skin almost instantaneously and it stays like that for a long time. My favorite lotion to date, and I don't mind the sweet smell. Do you guys have any skincare secrets? I've been such a skincare nut lately (ask my boyfriend) and I'm always looking for the next best product. Right now, while I'm running low, I've got my eyes on this Creamy Eye Treatment with Avocado from Kiehl's, and as mentioned earlier, Ole Henriksen's Truth Serum. I'm a sucker for lip balms, too, and wouldn't mind trying this: Burt's Bees Tinted Lip Balm in "pink blossom". Any thoughts? estee lauder's truth serum is wonderfullll! love it. thanks for sharing! so helpful. i am in desperate need of some new beauty products because i dont know anything about it haha. thanks! 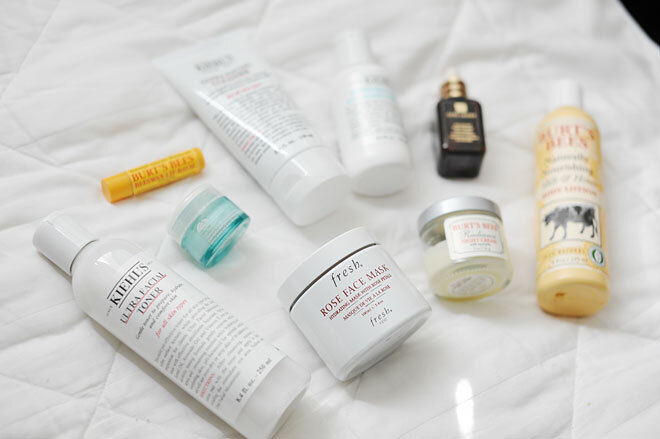 it's nice getting a little peek into someone else's skincare regimens! i love korres' pomegranate scrub, it's the best i've come across so far. I like your post so much! And these products are amazing! And ditto on the Truth Serum — I used the sampler from Sephora and it rocks! I love all products by FRESH. Great list! I love to cleanse my face with homemade green tea ice cubes (it's worth the extra chills) and follow up with Clarins pink clay mask or a citrus mask every other day. I find that varying products works well for Asian skin prone to oil. :) Just a lil' tip! Badger lip balms. I like it better than Burt's Bee's. I work retail and recycled air terrorized me for a week until I got the badger stuff. And I use a bottle of vitamin e oil religiously on my skin and lips before I go to sleep. I wake up with the best skin ever. Khiel's products are on my favorites ! I definitely need all the skincare tips I can get! Especially in the wintertime! In the morning if my face is a little puffy I'll put on an ice pack while doing stomach crunches. I can do 1000 now. After I remove the ice pack I use a deep pore cleanser lotion. In the shower I use a water activated gel cleanser, then a honey almond body scrub, and on the face an exfoliating gel scrub. Then I apply an herb-mint facial mask which I leave on for 10 minutes while I prepare the rest of my routine. I always use an after shave lotion with little or no alcohol, because alcohol dries your face out and makes you look older. Then moisturizer, then an anti-aging eye balm followed by a final moisturizing protective lotion. I'm currently using Ole Henrikson's Truth Serum and this stuff is amazing! You're right, it does feel refreshing on your face and I feel more energetic whenever I apply it on.